No. 352, Jalan Selesa, Happy Garden, Off Jalan Kuchai Lama, 58200 Kuala Lumpur, Malaysia. 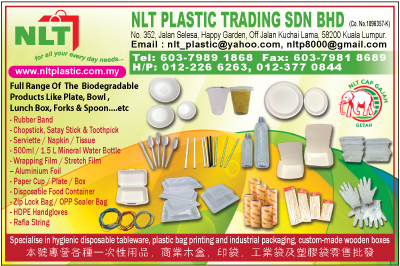 We specialize in providing a range of different sizes of plastic bags, packaging materials and hygienic disposable to various industries and for household consumption. The company further undertakes make to order supply of logo printed shopping bags for shops and supermarkets. As for our niche product, we also supply make to order wooden packaging boxes for all occasions.